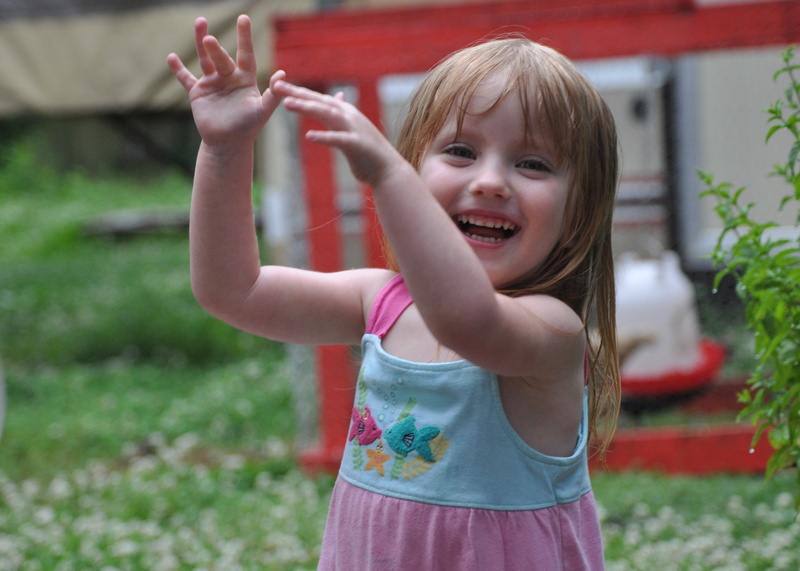 “What makes you happy?” was the question posed to me by my 3-year old granddaughter last night. Wow! What a simple, but deep question. It really makes you think. What does make me happy? And, if I know what makes me happy, then why don’t I do those things more often? Let’s start this story with a short recap of recent happenings that might be draining my happiness. It’s been a hard week/month… This week my middle son moved across country, my car broke, my phone broke, and busy season has started so I’m working 10-11 hour days. Last week I spent a whole day not knowing if my oldest son was dead or alive as his roommate had reported him missing to the police and he wasn’t answering my calls. Also, last week my youngest son turned 13, and I had a friend visiting from out-of-town (and her car broke while she was here). Then last month, I was sick twice, one of our mama rabbits died, my daughter announced she was getting married, we had family at our house visiting for several days (while I was sick), and we traveled to my parents house for several days for a visit. Some of these happenings were a lot of fun, and some are not. But they all have one thing in common — they create stress in me in one way or another, and I think this stress shows on my face. My grand daughter is awesome though. Even at the age of 3, she is very encouraging, nurturing, and uplifting. She has a genuine way of complimenting others that brings joy to their soul. 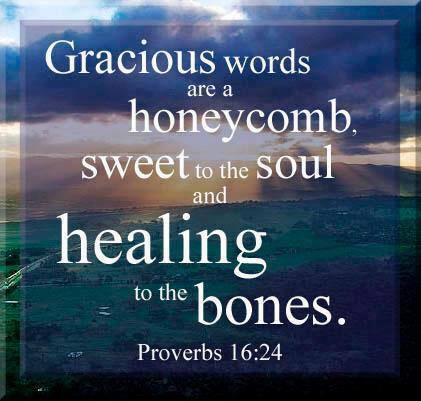 She exemplifies Proverbs 16:24. She often praises others and is very quick to offer compliments. In her child’s eye, high-five’s should be common practice. “You are wonderful!” and “You are so beautiful!” are common phrases in her dictionary. And you know, coming from her, that it is the truth. That that is what she truly sees and believes. Because, even though as a three year old she knows how to lie, she doesn’t yet understand the concept of telling someone something you don’t truly believe just to make them feel better. So when she asked me last night what made me happy, I believe that was her way of trying to help me put things in focus. And she is right… we should think more happy thoughts! 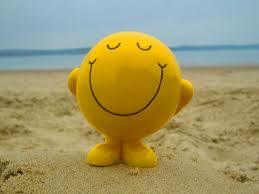 Happy thoughts will chase the blues away. They say ‘an apple a day keeps the doctor away’. However, I believe that having an optimistic, grateful attitude is even better than an apple. This is something that obviously I needed to be reminded of. So, today I choose to focus on what makes me happy. 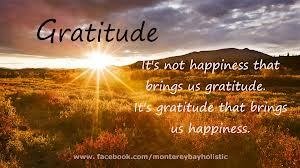 Today, I choose to be grateful and thank God for the many blessings that he has given me. 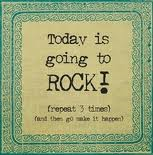 Today is going to rock! What makes you happy?? I love to hear what brings happiness to your soul. I think we could all use a whole mess of happy thoughts to help us put things in perspective. I know I could. Oh, and be sure to give someone a high-five today! This entry was posted in Family and tagged edifying, encourage, encouraging, genuine, gratitude, happiness, happy, optimistic by monkeyneedle. Bookmark the permalink. I pray this morning that you are able to focus today on the things that make you happy; that God will give you peace in the midst of your storms, strength to get through those long work days (that pay the bills! ), and joy in your quiet times. Happy Friday.